Driving Lessons in Reading | Call MSM Driving School Now. Are you looking for a reliable Driving School in Reading? Look no further! 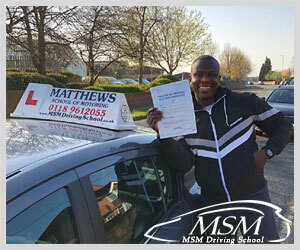 MSM Driving School has top quality Driving Instructors offering Driving Lessons in Reading and surrounding areas. 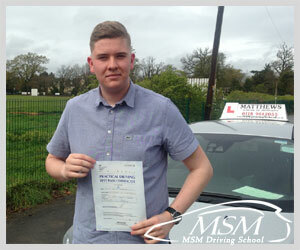 See what our customers have to say about learning to drive with MSM Driving School... Click Here. Will you be next to pass your Driving Test with MSM Driving School in Reading? ***BREAKING NEWS - 29th November 2018*** A First Attempt Driving Test Pass with ZERO Driving Faults for MSM Driving School... Click Here. MSM Driving School is Highly Recommended within the Berkshire Area. Our professional team of highly qualified, friendly and patient male and female Driving Instructors provide valuable one-to-one driving tuition, covering both theory and practical driving skills you need to get your driving licence as quickly as possible saving you time and money. Our structured learning program and knowledge of the local area, helps build up the confidence of our Learner Drivers to achieve their ultimate goal of passing their Driving Test as soon as possible. Save money and pass your Driving Test first time with MSM Driving School. We offer Manual Driving Lessons and Automatic Driving Lessons, Male and Female Driving Instructors, Intensive and Semi-Intensive Driving Courses, Theory Test and Hazard Perception Test Training, Motorway Driving Lessons, Refresher Driving Lessons, Mock Driving Tests, Driving Instructor Training and we are all Pass Plus Registered. We also offer discounts for Block Bookings and reduced rates for Students and NHS Staff. Come and see why so many pupils choose to learn to drive with MSM Driving School. Choosing the right Driving School and Driving Instructor is an important first step in successfully passing your Driving Test. MSM Driving School - Driving tuition you can trust. Don't just take our word for it... Click Here. I couldn’t have asked for a better instructor (Matt) a truly amazing man, very patient, kind and just a legend! He boosted my confidence in driving massively. Lessons were always a joy with him, never a dull moment lol. A very big thank you to him! Couldn’t have it done it without you Matt!! I 100% recommended MSM Driving school, definitely the best driving school out there! Really good experience with this driving school all are friendly and help with everything that u need to know about driving I would recommend this driving school to anyone. Quality lessons with Matt. An absolutely ace instructor who made me feel so comfortable in my lessons. Would recommend to any learner! After going through a number of instructors, I was really pleased when I found Matt at MSM due to his professionalism and dedication. He's really friendly and also an amazing instructor and equipped me with the necessary skills to enable me to pass my test first time. I would strongly recommend MSM to any learner driver! "I passed my test, thanks to Jason my instructor. His instructions were very clear. He helped me to understand the markings on the roads; everything else became much easier after that. He was very patient when I had a brief melt-down :) I would definitely recommend MSM Driving School." "Just wanted to pass on our thanks and gratitude for fitting Ed in over the past six weeks. Jason really helped to build Ed's confidence which I am sure has been key in him passing his test today. Could you please pass on our thanks to him and also to Sue. I'm sure she must have helped to keep Ed's nerves at bay this afternoon. Thank you so much." "Just wanted to say a huge thank you to our Son's driving instructor Sue. Thank you MSM Driving School for teaching him how to driver rather than how to pass the test. Very proud that he passed first time with zero faults. A fantastic achievement and one Sue should also feel proud of. We feel confident as parents that our Son is more than capable of driving solo." 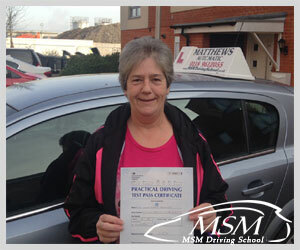 "I was very happy with my instructor, Matt, and my lessons. I thoroughly enjoyed them. I was always made to feel comfortable and always shown patience. 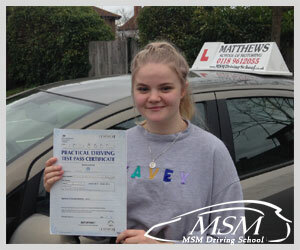 I passed first time and i would definitely recommend MSM to anybody wanting to learn!" "Learning with Matthew was a fun experience, with his relaxed and bubbly nature putting you at ease. 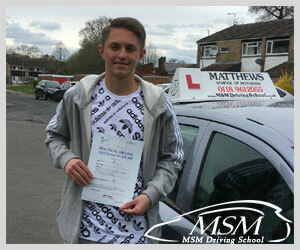 Matthew puts the student first, and is quick to accommodate your needs, making you feel secure and confident enough to pass first time. I highly recommend MSM based on the efficient communication and resources geared at making lessons as useful and valuable as possible." Are you looking for Learner Driver or New Driver Car Insurance? Click the above banner and get £20 discount on all new short-term policies and up to £20 discount on all subsequent short-term policies purchased. 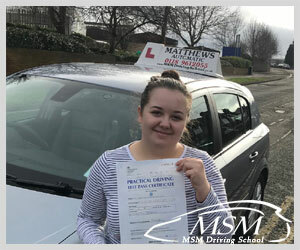 Driving Lessons in Reading with MSM Driving School - Driving Tuition you can trust. Click this banner and get £20 discount on all new short-term policies and up to £20 discount on all subsequent short-term policies purchased.